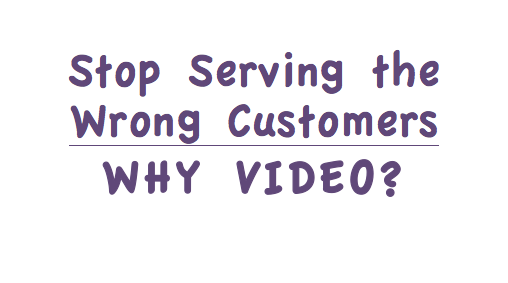 Stop Serving the Wrong Customers - Why Video? Do you ever notice that some of your customers just don't seem to be the right fit for your business? Personal bias aside, many of your customers may be outliers of your preferred target market..... and you probably already know this. The "wrong" customers tend to be more problematic that your other customers - the ones that seem to be a perfect fit. The wrong customers, if you'll allow me to use that term, just don't as aligned to your brand's strengths and therefor, for whatever reasons, they make it more difficult for you to serve them successfully. Whether you buy-in to the proposition that a customer may be wrong or not, maybe you'll agree with me that you would be better off if more of your customers were like so-and-so. You know, your favorite customer! Wouldn't you like to attract more of this customer-type than the wrong customer type? Video attracts the right type of prospects and customers. Why? Because it's authentic. Video allows you to share your story in your way and allows your audience to connect with you and your message. Your desired prospects and customers will embrace your business and offerings but they'll connect with you and your brand. And, the customers that are wrong for your business will likely never connect with your video message anyway. Voila! Problem solved. Imagine how great your like will be if you had customers that were the right fit for your business, not the plethora of outliers you may be herding today. Video can help you attract the right clientele, because video is authentic. Got Video for Business Growth?